For the racehorse, see Shaftesbury Avenue (horse). In the evening, street artists gather on the pavement outside the HQ of ICE - International Currency Exchange and Raphaels Bank (previously the home of Natwest) at the Piccadilly Circus end of Shaftesbury Avenue, and produce portraits for the tourists. 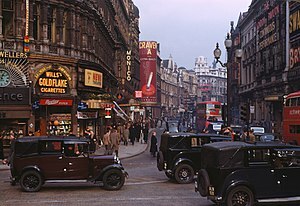 Wikimedia Commons has media related to Shaftesbury Avenue. Charing Cross Road is a street in central London running immediately north of St Martin-in-the-Fields to St Giles Circus and becomes Tottenham Court Road. It is so called because it serves Charing Cross railway station, what is now Charing Cross road was originally two narrow streets in the West End, Crown Street and Castle Street. 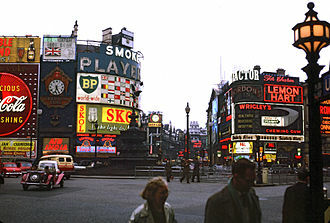 Charing Cross Road was developed, in conjunction with Shaftesbury Avenue, the total cost of building at a cost of £778,238. The two streets and others such as the Thames Embankment, Northumberland Avenue and Aldwych were built to improve traffic flow through central London, the road required some of the worst slums in London to be demolished, which delayed progress in construction while they were rehoused. Charing Cross Road is renowned for its specialist and second-hand bookshops, most of these shops are located on the ground floor of a block owned by a housing association, which decided in 2001 to raise the rents sharply to bring them closer to the market level. The associations counter-argument was that if the booksellers did not pay a market rent they were being subsidised by its low-income tenants, the booksellers attracted considerable public support and a reduced rent increase was imposed. Several of the bookshops closed nonetheless, including Silver Moon, reputedly Europe’s largest women’s interest bookshop, other shops closed more recently, Zwemmers art bookshop, Shipley the art bookshop in December 2008 and Murder One in 2009. Smaller second-hand and specialist antiquarian bookshops can be found on the adjoining Cecil Court, the northern section between Cambridge Circus and Oxford Street includes more generalist bookshops such as the venerable Foyles and Blackwells. A long-standing correspondence between New York City-based author Helene Hanff and the staff of a bookshop on the street, the book was made into a 1987 film starring Anne Bancroft and Anthony Hopkins and into a play and a BBC radio drama. A small brass plaque, noted by Hanff in her book Qs Legacy, the music venue the Astoria was located here, as is one of the sites of St Martins Arts College, opening in 1939. The Metropolitan Board of Works was the principal instrument of London-wide government from December 1855 until the establishment of the London County Council in March 1889. Its principal responsibility was to infrastructure to cope with Londons rapid growth. The MBW was a rather than elected body. This lack of accountability made it unpopular with Londoners, especially in its latter years when it fell prey to corruption, Londons growth had rapidly accelerated with the increase in railway commuting from the 1830s onwards. However, its government was chaotic, with hundreds of authorities having varying fields of responsibility. Providing a specific service in an area might need the co-ordination of many of these authorities. In 1835 elected municipal boroughs had been set up covering every major city except London, in 1837 an attempt was made to set up a London-wide elected authority, the wealthier districts of Marylebone and Westminster resisted this and ultimately defeated the move. In 1854 the Royal Commission on the City of London proposed to divide London into seven boroughs, the proposal to divide the city into boroughs was abandoned, but the board of works was set up in 1855. In order to have a body to coordinate local work to plan London. It was not to be an elected body, but instead to consist of members nominated by the vestries who were the principal local authorities. The larger vestries had two members and the City of London had three, in a few areas the vestries covered too small an area, and here they were merged into a district board for the purpose of nominating members to the MBW. There were 45 members, who would elect a Chairman who was to become a member ex officio. The first nominations took place in December and the Board met first on 22 December 1855 where John Thwaites was elected as Chairman, the board took over the powers and liabilities of the Commission of Sewers and the Buildings Office on 1 January 1856. A major problem was sewage, most of Londons waste was allowed to flow into the Thames resulting in a horrendous smell in the summer months, in 1855 and 1858 there were especially bad summers with the latter being known as The Great Stink. A notable achievement of the Board was the creation of the core London sewerage system, including 75 miles of main and 1000 miles of street sewers, which solved the problem. Bartitsu is an eclectic martial art and self-defence method originally developed in England during the years 1898–1902. In 1903, it was immortalised by Sir Arthur Conan Doyle, although dormant throughout most of the 20th century, Bartitsu has been experiencing a revival since 2002. This art, he claimed, combined the best elements of a range of fighting styles into a unified whole and he defined Bartitsu as meaning self defence in all its forms, the word was a portmanteau of his own surname and of Jujitsu. Bartitsu included a physical culture training system. Judo and jujitsu, which are secret styles of Japanese wrestling, the same, of course, applies to the use of the foot or the stick. Between 1899 and 1902, Barton-Wright set about publicizing his art through magazine articles, interviews and he established a school called the Bartitsu Academy of Arms and Physical Culture, known informally as the Bartitsu Club, which was located at 67b Shaftesbury Avenue in Soho. In an article for Sandows Magazine of Physical Culture vol,6, journalist Mary Nugent described the Bartitsu Club as. A huge subterranean hall, all glittering, white-tiled walls, and electric light, kaneo Tani and Yamamoto soon returned to Japan, but Yukio Tani stayed and was shortly joined by another young jujutsuka, Sadakazu Uyenishi. Swiss master-at-arms Pierre Vigny and wrestler Armand Cherpillod were employed as teachers at the Club, as well as teaching well-to-do Londoners, their duties included performing demonstrations and competing in challenge matches against fighters representing other combat styles. It is likely that the actors Esme Beringer and Charles Sefton, in mid-1901, the curriculum of Bartitsu was further expanded to include breathing exercises under the tuition of Mrs. Kate Behnke. As well as the gymnasium, the Bartitsu Club incorporated a well-appointed salon equipped with a wide range of electrotherapy machines. Promoters of the Club included politicians Herbert Gladstone and Lord Alwyne Compton, Barton-Wright reported that, during this period, he had challenged and defeated seven larger men within three minutes as part of a Bartitsu demonstration he gave at St.
Bethnal Green was a civil parish and a metropolitan borough in the East End of London, England. It was formed as a parish in 1743 from the Bethnal Green hamlet in Stepney ancient parish. The vestry became an authority to the Metropolitan Board of Works in 1855. In the 1900 reform of government caused by the London Government Act 1899 the parish became a metropolitan borough which bordered Hackney, Stepney. In 1965 it was abolished and merged into the London Borough of Tower Hamlets, until 1743 Bethnal Green formed a hamlet within the large parish of Stepney. By the 17th century the settlement had achieved a measure of self-government, with its own overseer and beadle. It remained an area until the beginning of the 18th century. The population rapidly increased and in 1743 an act of parliament constituted Bethnal Green as a separate parish, as well as forming a parish for ecclesiastical purposes, Bethnal Green was created a civil parish with responsibility for relief of the poor and maintenance of highways. The government of the parish was shared by a vestry, governors of the poor, a further board of paving and lighting commissioners were established in 1843. 1 or East, No.2 or North, No.3 or West, in 1889 the Metropolitan Board was replaced by the London County Council, and Bethnal Green was formally removed from Middlesex to the new County of London. Bethnal Green was part of the ancient parish of St Dunstan, Stepney in the Diocese of London, accordingly, in 1900, a borough council consisting of a mayor, five aldermen and 30 councillors replaced the vestry. 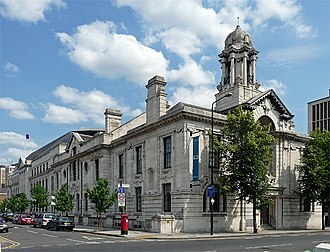 The boundaries of the borough and parish were realigned at the same time, Bethnal Green Town Hall in Patriot Square was opened in 1910, and extended in 1936-9. The architects were Percy Robinson and William Alban Jones, in 2010 the building was reopened as a hotel, much of the original art deco interior has been retained. His identity was revealed at the wedding feast of his daughter Bessie, a depiction of the beggar had appeared on the head of the beadles staff dating from 1690. The name Chinatown has been used at different times to describe different places in London. The present Chinatown is part of the City of Westminster, occupying the area in and it contains a number of Chinese restaurants, supermarkets, souvenir shops, and other Chinese-run businesses. 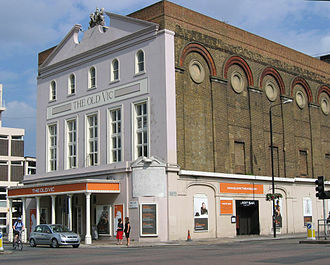 The first area in London known as Chinatown was located in the Limehouse area of the East End of London. At the start of the 20th century, the Chinese population of London was concentrated in that area, the area began to become known through exaggerated reports and tales of opium dens and slum housing, rather than the Chinese restaurants and supermarkets in the current Chinatown. However, much of the area was damaged by bombing during the Blitz in World War II. After World War II, the popularity of Chinese cuisine. The present Chinatown, which is off Shaftesbury Avenue did not start to be established until the 1970s, up until then, it was a regular Soho area, run-down, with Gerrard Street the main thoroughfare. Other businesses included a bakers, the Sari Centre, Lesgrain French Coffee House, Harrison Marks Glamour Studio. Probably the first Chinese restaurants opened in Lisle Street, parallel to Gerrard St, the Tailor & Cutter did not close down until around 1974. The area boasts over 80 restaurants showcasing some of Londons finest and most authentic Asian cuisine, in 2005, the property developer Rosewheel proposed a plan to redevelop the eastern part of Chinatown. The London Chinatown Community Centre has been housed in the Chinatown area since it was founded in 1980 by Dr Abraham Lue, the Centre claims to have received 40,000 people for help and assistance since its foundation. Located since 1998 on the 2nd floor of 28-29 Gerrard Street, vale Royal House, a large residential block, houses a number of families and single men and women. The block was built in the 1980s and houses the China Town car park underneath it, john Dryden lived for a while at 43 Gerrard Street, which is commemorated by a blue plaque. Another plaque, on number 9, marks the meeting of Samuel Johnson and Joshua Reynolds at the Turks Head Tavern to found The Club, a dining club, in 1764. The NatWest branch at Leighton Buzzard, Bedfordshire, an example of Neo-Renaissance architecture. The former NatWest Tower (now known as Tower 42), from the junction of Bishopsgate with Leadenhall Street in the City of London. The old Town Hall at Ealing, London, built by Charles Jones in 1872, now a NatWest branch. 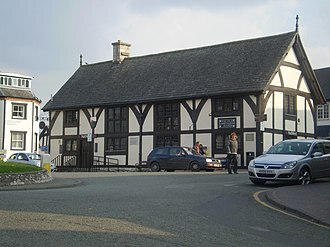 The old court house at Ruthin, Denbighshire, built in 1401, now a NatWest branch. Illustration from theatre programme of 1936 based on a photo of the Saville Theatre, featuring the play The Limping Man, a 1931 play by William Matthew Scott. William Hunter plaque on what is now the side of the Lyric Theatre. The Windmill Club, formerly the Windmill Theatre, now a table dancing club. Film House at 142 Wardour Street, formerly the headquarters of the Associated-British Pathé film company.